It is often heard that product meets performance and functions although it has no marking on it. However, why do we need to spend time and money on marking? We think that marking is needed for production management, quality control and manufacturing history management (traceability) of the products, and it has another value apart from performance and functions. We place importance on the great significance that is hidden of marking small characters. Therefore, we develop a seemingly simple work of marking system including management after shipment and suggest to apply the system to every product in every manufacturing industry. The carving group in our manufacturing division lies in the product line requiring high skills, such as marking for registration, fine characters, and carving on high hardness steel, difficult-to-machine materials. We invest traditional technique of hand-carved on advanced equipment NC for required high-precision manufacture to meet customers’ demands. Traditional human technologies to NC device with technic and efficiency. Side by side with NC device, hand down the skills of burin to young technicians. Our mechanical-design division has worked on high-precision and man-hour reduction of 3D CAD design. The 3D CAD has a structure analysis software “FEM analysis” built-in. The designed equipments which merged with late developed tools have made reputations for handy, high precision, high quality, high durability from a wide range of our customers. Our electric-design division has designed programs for all control equipments of customers. We early recognized necessity of stamping character recognition and inspection, and developed the system which is not affected by ambient light and reflection to complete in-process “character recognition”, “stamping depth measurement” and “missing character detection”. The 3D sensor is high-performance, available to use as an inline sensor. It performs until quality check in-process, and becomes to lighten the burden of character inspection, and to abolish designated works. Three-dimensional prior confirmation for intersection parts by 3D CAD. Use “FEM analysis” for measuring deflection. We pursue to merge “compact” and “high rigidity” all the time. We share the customers’ demands in sales department, design department and engineers after we have received inquiries. Also we come up with ideas for marking, and help to solve customers’ difficulties. Collaborate with manufacturing department’s engineers that visit the customers and communicate directly when delivering. We manufacture the equipments that customers are satisfied. Our specialized staffs ask the demands and the specifications from customers, and prepare documents for common understanding. Each department shares the customer’s demands. after receiving the customer’s order. We have a meeting for the final confirmation of the specification based on the drawings with the customers before manufacturing. 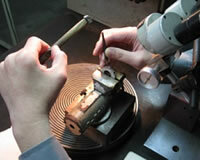 We advance to manufacture after confirm and determine specifications and drawings. Also confirm customers’ demands on each occasion in-process. Test for functions, quality and safety with the customer at our factory. Test run and adjustment at delivery place, attendance for delivering, operation training and maintenance guidance. After delivering completely, submit the complete-book to the customer, and ask to inspect for acceptance.